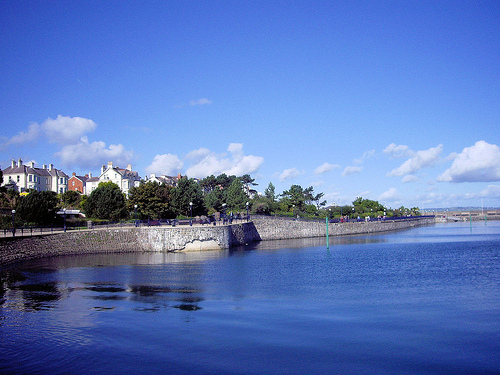 The southern coast of Belfast is where you will find the seaside town of Bangor. This pretty little seaside town has been popular with visitors and those on day trips for centuries. It is a year round destination for those looking to enjoy a relaxing break by the sea, such is the popularity of the place that there are events planned that take place right through the year. No matter what time of the year you choose to visit Bangor you will find plenty to see and do to make your trip an enjoyable one. A visit to the town would not be complete without a visit to Bangor Abbey which was built in 558 AD under the guidance of Saint Comgall. In the cemetery here you will find a memorial dedicated to the ship surgeon that sailed on the Titanic. As you spend time walking around the church and the churchyard you will get a good sense of the history of the town and the way that it has developed and changed over the centuries. More information relating to the abbey and the long history of the town can be viewed at the Heritage Centre that is located behind the Town Hall, in Castle Park. At the Heritage Centre you will find live action shows and interactive displays that are open all year, giving you an insight into how the town has changed across the centuries. One of the big attractions for families is Pickie Fun Park. It make a delightful place to spend an afternoon as there are playground facilities for the younger members of the family, pleasure boats on the lake and more than enough room for the kids to run off all of their excess energy. Make the most of the beautiful coastline here by following one of the beautiful coastal walks from Bangor across to Crawfordsburn beach and then keep walking through to Helens Bay. It is the perfect walk for a sunny day and there are plenty of places where you can stop for a spot of refreshments along the way. This is a part of the coast where bird watching is a popular activity too and there is plenty of natural wildlife in the area that you can spot on your walk. Another popular beach in the area is Ballyholme Beach; although not strictly in Bangor it is a wonderful expanse of beach that stretches across from Seacliff Road through to Ballymacormick Point. This is a popular location for water based activities too. The marina here really is something to see as it is regarded as one of the premier marinas in the UK with services second to none. You will find all kinds of vessels moored here from small two man craft to luxury cruisers, and plenty of other pleasure craft in between. There are all kinds of different stores and services located around the marina and it offers a wonderful atmosphere to visitors, plus the kids will love seeing all of the different boats at the moorings.